The Thai Prime Minister Yingluck Shinawatra faces impeachment within a matter of weeks. However, her supporters are reported planning to challenge any move to dismiss her by arming militias. 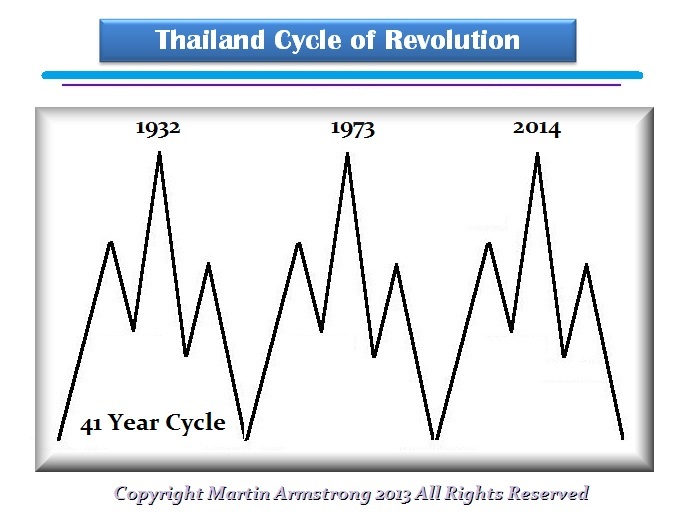 This is right on schedule with the 41 year cycle in Revolution for Thailand. The democratic process seems to be declining. The last Thai Revolution was October 14, 1973. The popular uprising of known as the “October 14 Event”; or “Day of Great Sorrow”, was a watershed event in Thailand’s history. The uprising resulted in the end of the ruling military dictatorship and altered the Thai political system. Notably, it highlighted the growing influence of Thai university students in politics. Previously, there was the Siamese Revolution of 1932 that was really a Siamese Coup d’état. The Revolution of 1932 was a crucial turning point in Thai history in the 20th century that was nearly bloodless transition on June 24, 1932. The political system of government in Siam was changed from an absolute monarchy to a constitutional monarchy similar to Britain. The revolution was brought about by a comparatively small group of military and civilians, who formed Siam’s first political party known as the Khana Ratsadon (Peoples’ Party). The revolution ended 150 years of absolutism under the Chakri Dynasty and almost 700 years of absolute rule of Kings over Thai history. The Revolution was a product of global historical change as well as social and political changes domestically. The revolution also resulted in the people of Siam being granted their first Constitution.